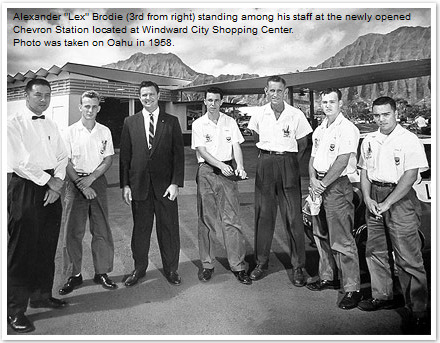 Lex Brodie's Tires was founded by Alexander "Lex" Brodie in Honolulu, Hawaii. Lex first opened up a Chevron Station at the Windward City Shopping Center in 1958 which immediately prospered. Besides selling gasoline to his customers he also specialized in tires, but lacked room to store them. So he warehoused his extra inventory in his home garage, but for some reason customers started driving up to his house to buy tires. Since the demand for tires were high, Lex decided to open his first tire store on Queen Street in 1964. Mr. Brodie became well known for his high standards of customer service. His enclosed waiting room with a TV, magazines, and a phone were a first. He trained his sales people to only sell what his customers needed and no more. They were also trained to meaningfully ask, "How can I help you?" and to listen to the full story. After which they would thoroughly inspect the vehicle and explain to the customer all of their options. The popular tire company grew to five stores on Oahu-all of which are still operating today. In 1993, Lex Brodie's Tires expanded their operations to Hilo on the Big Island. In seeing the need to better serve the outer community, a second location opened in Pahoa in 1997. Quickly outgrowing that facility, we built and moved into a new store-double in size located at the Pahoa Marketplace. With the overwhelming support of our customers, Lex Brodie's Tires expanded to the West Side of the Island. In 2004, we began operations in Waimea and Kona. Lex Brodie's Tires locations were able to grow because of our reputation- to always provide excellent customer service and quality tires. And as always, Lex Brodie's number one concern is your safety on the road. We like to take this opportunity to say "Thank You… Very Much!" for being our customer.